After the Alaskan let down, time for some redemption. 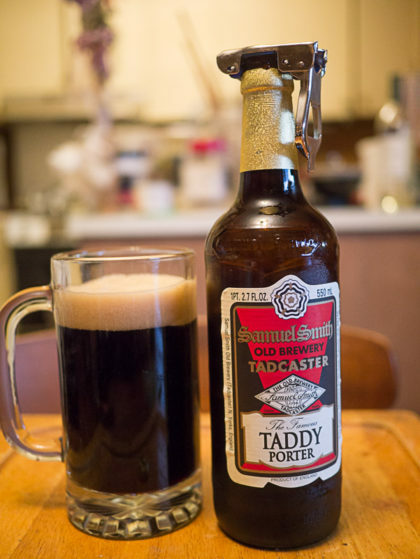 An oldie but goodie, Samuel SMith’s Taddy Porter, pours extremely dark brown with strong head. Dark malt aroma, tones of dark fruit. dark roast bitter. Strong carbonation keeps the mouthfeel medium, cleaner than you would expect from something so dark. Solid 3 out 4 taddy monkeys. 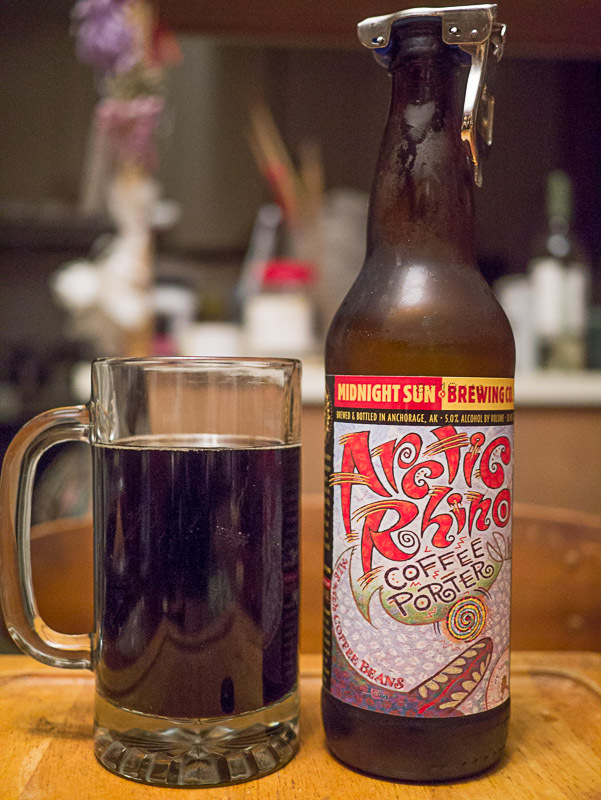 Next in the lineup, a coffee porter from Alaska. Pours opaque dark brown, light head. Immediate coffee aroma. Strong bitter of coffee, not a whole lot else. Medium thick mouthfeel. Coffee is all fine and good, but this is too much coffee, not enough porter. Not terrible, but I don’t especially like it either. 2 out 4 coffee infused monkeys. 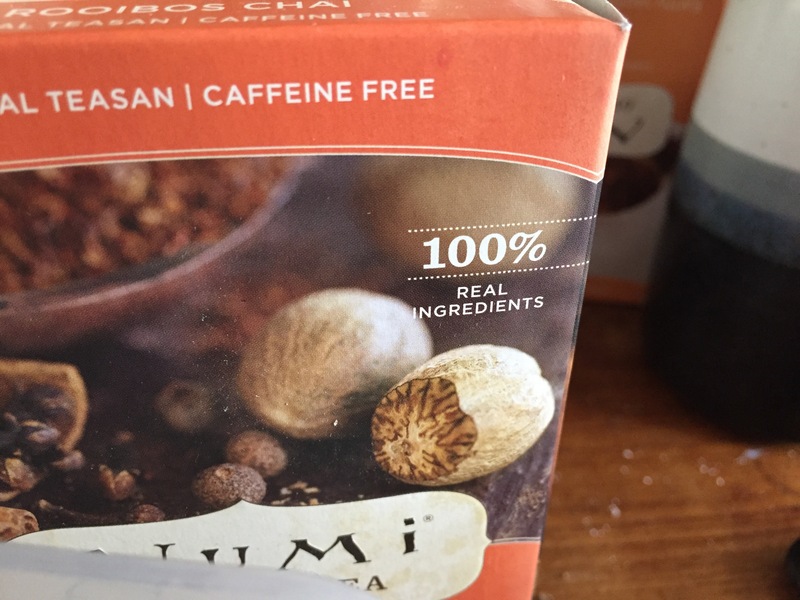 Sitting here eating lunch and i notice this blurb on the package of my favorite tea, “100% real ingredients.” WTF is that supposed to mean?! You mean theres food out there with imaginary ingredients? Virtual ingredients? Dang he wasn’t messing around, yet another imperial stout gift! This one from Oregon’s Full Sail. Pours opaque dark dark, practically black, brown, very light head. The dark kinda peaty smoke aroma immediately detected from opening the bottle. Bourbon and cask detectable from the start. Dark malt, but surprisingly not that heavy on the roast flavor, bitter pretty modulated. The astringent stays on the tongue for a little while, but it doesn’t have the bite of a heavy hop. The 9.5% ABV is not as masked in this as the other imperials I just had, it doesn’t have as much sweet covering things. 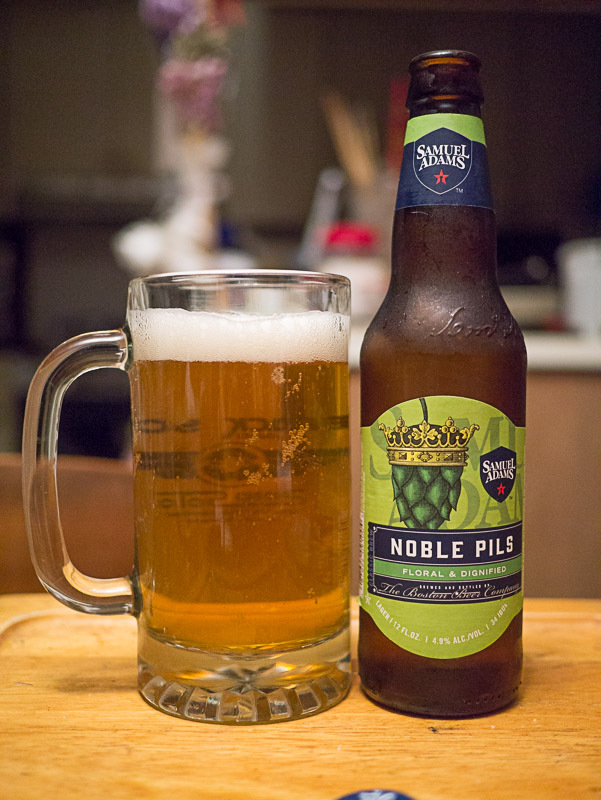 Mouth feel is medium, not as heavy as might expect, but the carbonation is light. Like most good stouts, it takes well to warming, but doesn’t seem to really bloom much either. Oh myyyy, that ABV is kicking in now! A solid 3 out of 4 casky monkeys. Next up on the dark train is this Imperial Stout from relatively young brewery Belching Beaver. I’m normally not a fan of what some call “gimmick” beers, and this really sounds like one, name of brewery, brew and the label really. Horchata is a sweet milky drink made with ground up nuts and/or grain of some type. May or may not have actual milk. 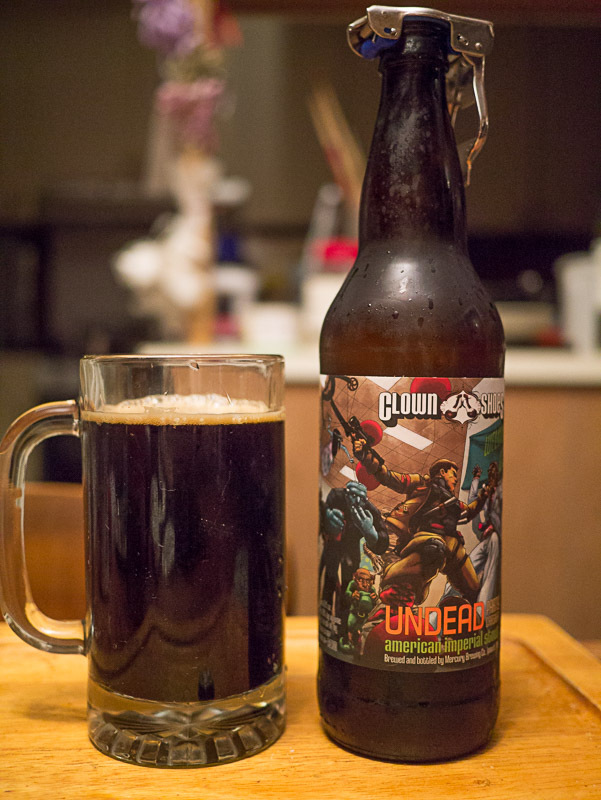 So this is basically a hopped up milk stout. Pours opaque dark brown with red tint, medium light head. Dark chocolate aroma and touch of spice. Sweet dark stonefruit, like prune, touch in middle tapering to a mellow bitter and smoke. Medium thick mouthfeel. The 9% ABV is hidden pretty well, dangerously easy drinking. This is like an ultra premium dark chocolate liquor fruit truffle, in a glass. 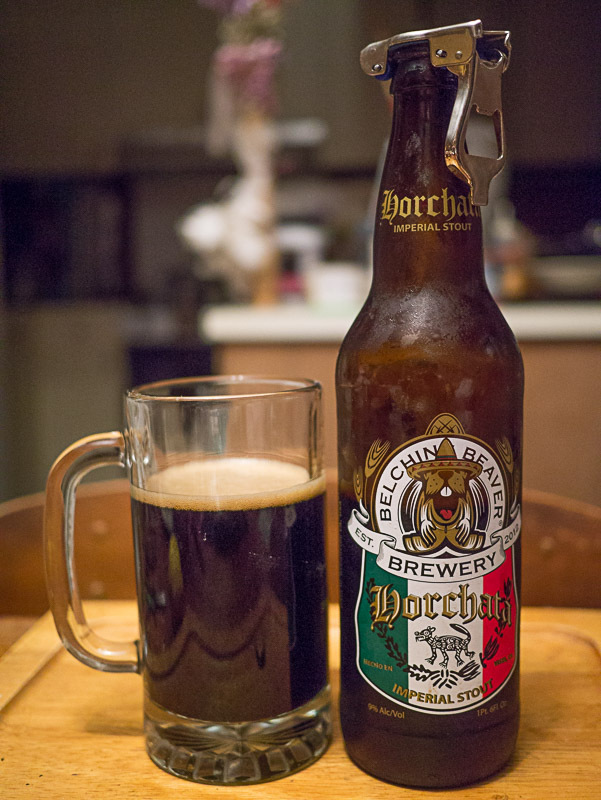 It actually went awesomely well with the Azteca mole enchilada I had the other night. 4 out 4 belching monkeys. Received gasket other day from Rockauto.com for the gas level sender. Shipped promptly with no minimum, Amazon had this exact same but would not ship it without a minimum order. There were online review bits saying they did not fit their Toyota, so I was a little doubtful. On the night I received I tried it out. The sender is easily accessed through a panel under the rear seat. The gasket is the proper size, but the bolt holes did not line up. If you try all the positions, there was one orientation where all but one hole lines up. I took a leather hole punch and made a new hole and all is good. If the gauge reading 1/4 tank all the time starts really bugging me, I guess I can order the replacement unit, but $6 vs $200 is good for now! Part of rental tithe for my bike bag, I received this since I told them I’m a dark beer guy. Pours dark opaque with light head. 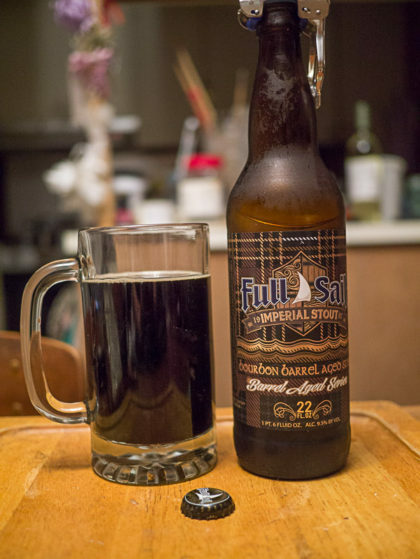 Dark malt aroma, a bit of dark chocolateness, nicely balanced smokyness, evenly distributed bitter, medium thick mouthfeel. High ABV, 10%, but you don’t immediately detect it. It may have a goofy name, but this is an excellent beer. 3 out 4 undead monkeys. Oops, old post from November that was hiding in the drafts box! Received my order from Belmetric.com. 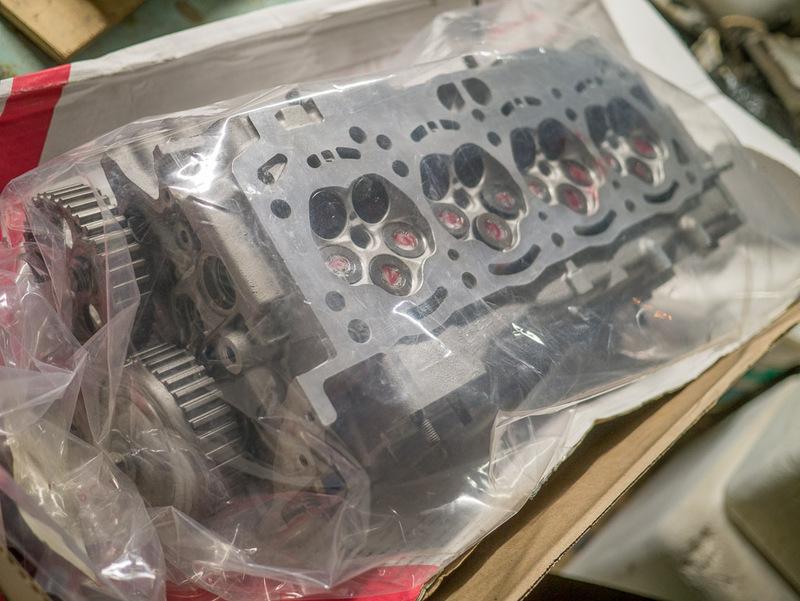 Prompt processing, shipping and reasonable rates. 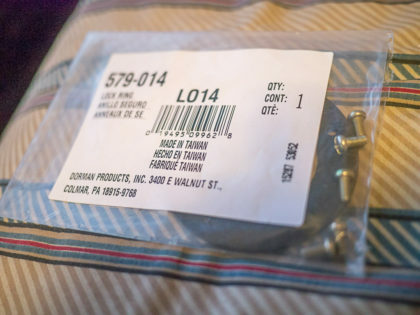 They specialize in metric hardware, of which hose was what I wanted. 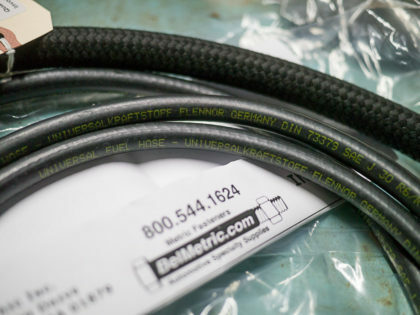 Hard to find metric hose, usually just end up buying the closest sized standard size hose. Hose stretches so you can make it work, but usually if the OEM used spring type clamps, they won’t clamp tight enough. This is for fuel lines, so even more so I wanted the correct size. Thus these lines from German company Flennor. There seems to be some noise about timing belts from Flennor not fitting correctly. I guess we shall see about the quality of these hoses. They look fine. And I should probably not mix languages, that titled would actually be German Pants. Part of Sam Adams latest variety pack, of which I did not buy as it did not have much I was interested in. Pours clear medium dark yellow with medium head. Hop forward aroma, bitterness that lingers throughout. Hint of citrus note. Clean mouthfeel. I can’t say this is one of my more likeable pilsners, no skunk funk and not overly floral, but still a bit more hoppy than I’d like. 2.5 out 4 noble monkeys.